Wow, as I post this, it's nearly time for the live broadcast of the 2019 ALA rewards! Did your favorite titles receive a medal? I've read some wonderful books this week, books showing people's kindnesses and strength, things that help make all of our lives better. Meet Caleb and big brother Bobby Gene, two brothers who love having adventures in the woods behind their house. But Caleb dreams of venturing beyond their ordinary small town. He wants more and more, and a new "older" Styx Malone, a neighbor on the other side of the woods, seems well able to take him there. He promises the brothers that together, the three of them can pull off the Great Escalator Trade–exchanging one small thing for something better until they achieve their wildest dream, a moped. The boys are eleven and ten, and in today's world, at least in the city, it's hard to imagine the freedom they do have. But they are African-American, their dad wants to keep them safely staying in their ordinary small-town world. Caleb, especially, has other grander ideas. But as the trades get bigger, the brothers soon find themselves in over their heads. 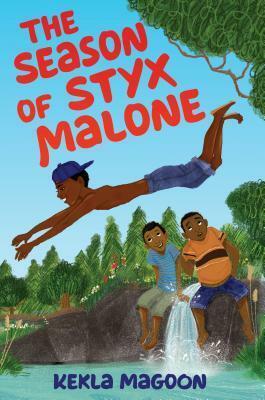 Kekla Magoon knows her characters, shows us readers hints that make the story more complex than can be imagined. Caleb tells the story and early in the beginning adventure thinks: "I had more questions for Styx. A hundred more. A thousand more. All the questions that the world might answer between the time a person is ten and the time he becomes sixteen." Styx has secrets–secrets so big they could ruin everything. And so the tension rises, though the reader is given a break now and then to take a deep breath. Styx at one point shows the boys how to slow down, to feel the summer. Caleb closes his eyes and thinks, "The moment felt like Saturday, like summer heat, like adventure. It felt as big as the sky above us and as firm as the ground beneath. It felt like the soft swish of corn tassels and being one step closer to an impossible dream." One feels the allure Styx offers and the yearning for anything but ordinary. That's what Styx show these young boys, although what happens is not what Caleb imagines will happen, but perhaps something better. It's a wonderful story of friendship, loyalty and some heartache mixed in, too. When I traveled to NYC with students a few years ago, each student researched important places we would visit and gave a talk about that place before we traveled. Thus, I know this story of the Roeblings, the tragedy of the early death of the father and the later debilitation of the son, thus his wife, Emily, took over the day to day management of this great bridge building. In graphic style, the amazing story is now told by Peter J. Tomasi, illustrated with great emotion by Sara Duvall. It's an adventure, even more so to me that it occurred, the bridge completed, in the nineteenth century. I enjoyed understanding more about the problems, the sad deaths because of the deep work constructing the caissons. It was called 'caisson disease' then, but today we know it was the 'bends'. There was corruption, caught thankfully by Washington Roebling's faithful assistants. There was outrage that a woman was directing the later construction, Emily Washington, beloved and faithful wife, taking over when Washington was incapacitated. And finally, there was joy, the bridge was completed. I walked that bridge, spent most of a day there with students, reading more, sketching, taking pictures. It is a wonder, New York City and Brooklyn's wonder, as is this new graphic story. 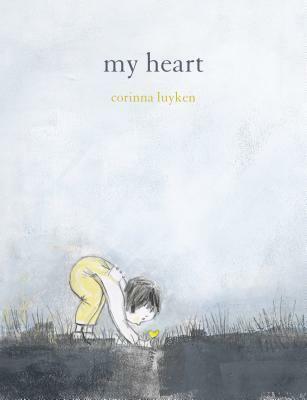 There is more than one book for children and for adults about grief, and how those particular characters handle a devastating loss. Dan Gemeinhart has offered a living example of a story that shouts it loud, a response that equals others, but with a twist. Some people say goodbye and try hard to move on as best they can. This time, Coyote Sunrise, a twelve-year-old girl and her father Rodeo say goodbye by taking off on a school bus they've made their home. They travel all over the U.S. and haven't returned home for five years! That's how long it's been since Coyote's mom and two sisters died in a car crash. Rodeo says the only way to really keep living is to move forward, never backward. He says she can't call him "Dad" anymore. It feels to me like others do this too. They don't take off in a school bus, but manage to shut all the past inside, never looking back. This story shows that idea of "forward" isn't always helpful, at least until one goes back for a while, allowing the past to be part of the future. Every time Dan Gemeinhart shares a new book, he shares one that is not easy to put down, making me want very much to see how it's all going to end, this time, how Coyote is going to make things right for herself. She's grown up fast these years. She is feisty and funny, knows how to do things on the travels, but most of all she's thoughtful and kind. And so is her dad, her Rodeo. 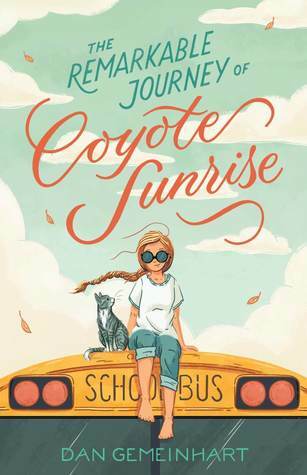 But when Coyote discovers that the park near her old home is being demolished, the same park where she, her mom, and her sisters buried a memory box, she plans how to get her dad to drive back across the country, without him realizing it. He's continued to say it's a 'no-go' back home, but she's determined, and along the way, picking up a misfit crew that happen to need to go cross country, too, we learn that thoughtful kindnesses make a good kind of family, new friends that make going home, the hardest trip of all, easier. I marked so many beautiful parts of the writing, but will share only two, Coyote's thoughts when thinking of a special time, a feeling like 'when you're in a moment that somehow lifts up free from the rest of your life." She says, "It's like the first time you ride a bike: All at once, out of nowhere, the wobbling world settles down to thrumming harmony, there's a balance that goes down to your bones, a kind of balance you never knew was there until it came alive all around and inside you; the falling stops and the flying starts and everything just hums, everything just rings true." And, referring to one of her memories, Coyote tells "It feels sweet and gritty like brown sugar in my mind." That's the voice you will love as she tells her story, the voice that doesn't stop living the life she wants to live. Recommended to every reader who may not understand how wise children can be until we listen and to readers who may need to know what it means to be a real friend. I finally had the chance to read and enjoy this book that many are praising, thinking it's a great companion to all the books above. It's written in a poem about a heart encompassing all its feelings. On the back cover are these words: "Tiny can grow and broken can mend/and a heart that is closed can still open again." Illustrations also tell the story with blacks and greys showing dark times -- a tall fence, driving rain, a jagged fence -- but also add that luminous and optimistic glow of yellow. For individuals or a group, I imagine many will connect personally to personal up and down feelings, and gestures that make a difference. Set in the magical illustrated world of Astrid Lingren (per info on the book cover) are three fairy tales collected by Kitty Crowther and translated from German, originally published in New Zealand. I saw it at my library, was intrigued. Three tales asked for by the little bear, all new to me, clearly from another tradition, and favorites. The pink seems to indicate love and feeling safe. The characters in the stories re-emerge in the little bear's dream. One memorable line: "As Bo reached the shore, he wondered if his friend Otto the otter was still awake, writing poems on stones and throwing them out into the sea." 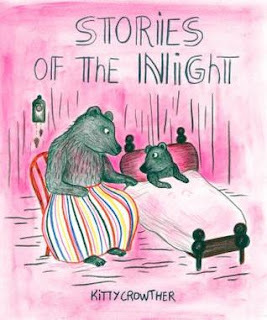 Speaking of awards, Kitty Crowther is a Belgian illustrator and children's book writer; she won the 2010 Astrid Lindgren Memorial Award from the Swedish Arts Council, the biggest prize in children's literature. She was cited in the jury notes as "the master of line but also of atmosphere". Next: Perhaps one from my #MustRead list or perhaps one from the awards lists that I missed. I love everything you shared about Coyote -- such a beautiful book with so much to learn along the way. I'm thrilled to have purchased a copy for my home in hopes that my children will love it as much as I did. The Bridge is brand new to me. I'm adding this one my my list (and I supposed this means I need to plan a trip to NYC one of these days). Thank you for all these wonderful glimpses, Linda! I always have a big take-away when I read your posts. If The Bridge gets you to NYC, that's awesome, Shaye. I own Coyote, too, just had to purchase it. Now we have to wait all year to see if it garners a big award! Thanks! Ooh, I know a few engineering-obsessed kids who'd love The Bridge, and I've been seeing My Heart just popping up everywhere recently. The Bridge & the Roebling story is fascinating, something accomplished so long ago! My Heart is a sweet, sweet book. Enjoy, Jane! Thanks! I really enjoyed Coyote Sunrise, too. It's definitely a great "road trip" book. I have My Heart in a stack of books I just picked up from the library, so I'm looking forward to reading it this week. Thanks for sharing and have a wonderful week! Thanks, Jana, yes, Coyote is a marvelous book. Enjoy My Heart, a special one. I'll look forward to what you share from that stack next week! I love the quotes you picked from Coyote Sunrise. They remind me of how much I loved that book! I'm so glad, Lisa. I loved it, too, as you read. Dan Gemeinhart's words are 'just right'! Ohhh, I am excited to read the Dan Gemeinhart book. I love his writing! Thanks for your review. HAPPY ALA AWARDS DAY, my friend! Enjoy when you can! Yes, the morning was so-o-o exciting! More books to love! Thanks, Ricki! 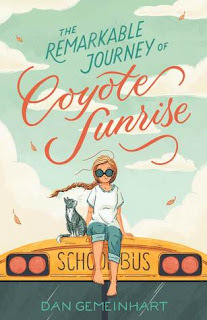 Coyote Sunrise is a character I can hardly wait to meet! The Season of Styx Malone is now on my list. I went to goodreads after reading your review here, but it was reading this in the blurb there, "has the warmth of a modern-day The Watsons go to Birmingham--1963" that sealed it for me. Both books are wonderful, Cheriee. I hope you enjoy them like I did. Thank you! Thanks, Kellee. I'm sure you'll get to them when you can. So many book. . .
Oh Coyote! Your review makes me want to reread it again. My Heart was beautiful in words and art and a great book to read aloud. I did love it very much, and My Heart, too, Laura. Glad to hear you also did. Thanks! I just got Coyote written up for my next week post! Loved spending time with her and Rodeo. My Heart is in my pile, I feel badly I haven't gotten to it yet. Books are piling up around me! Styx Malone is also in the pile! Happy reading this week. I just picked up a bunch, ordered from the awards given so I have a stack, too. Will love seeing your review of Coyote. I imagine you'll like Styx a lot. I thought it was a good story. Thanks, Michele. I too met Styx Malone this week and it was a wonderful experience. I'm heading to New York for the first time this summer, so I definitely want to get The Bridge. I know nothing about the construction. My Heart looks beautiful. Isn't it fun to stumble on books like Stories of the Night? It's a treat to find things in the library that you didn't even know existed. 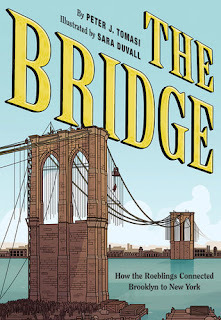 I am excited about your NYC trip & it is a must to read this book, or something about the Brooklyn Bridge, then walk it! It's a magical experience. So glad you loved Styx Malone, too. I enjoyed it very much. And yes, I put holds for my books, but also browse at the library, finding new ones! Thanks, Crystal!